The Ocean Cleanup, a Dutch non-profit organization developing technologies to rid the oceans of plastic waste, has launched the world’s first ocean cleanup system from San Francisco Bay. Ironically, the cleanup system, dubbed System 001, relies heavily on plastics to complete its mission of ridding the Pacific Ocean of any plastic debris millimeter in size or larger up massive discarded fishing nets (ghost nets), which can be tens of meters wide. System 001 consists of a 600-meter-long (2000-ft) U-shaped floating barrier with a three-meter (10 ft) skirt attached below. It was fabricated from 12-metre sections of extruded HDPE joined together at a shipyard near Oakland and incorporates a three-meter deep “skirt” made of polyester resin that dangles beneath the boom to prevent litter from escaping under it. Buoyant plastic tends to float within a metre of the water’s surface and are captured by the skirt. The boom, which is driven by the current as well as waves and wind, always moves faster relative to the plastic waste floating in the ocean, which is propelled by the current alone. It therefore scoops the litter up as it drifts. Marine life, meanwhile, will be safe from the system according to its developers. Firstly, the system drifts through the ocean at extremely low speeds—slow enough for sea creatures to swim away. Secondly, because the screen is impenetrable, the current will flow underneath the screen, guiding with it organisms that cannot actively move, while the plastic (which floats) remains inside the system. Thirdly, as the screen is not a net, sea life cannot become entangled. Finally, plastics will only be removed from the water periodically, which means people will always be present to check for marine life before the plastic is lifted out of the water. System 001 is heading to a location 240 nautical miles offshore for a two-week trial before continuing its journey toward the Great Pacific Garbage Patch, 1,200 nautical miles offshore, to start the cleanup. System 001 is being towed from the San Francisco Bay by the vessel Maersk Launcher, which has been made available to the project by A.P. Moller-Maersk and DeepGreen, its current charter holder. Hundreds of scale-model tests, a series of prototypes, research expeditions and multiple iterations have led to The Ocean Cleanup having sufficient confidence in its technology to launch its first full-scale cleanup system. 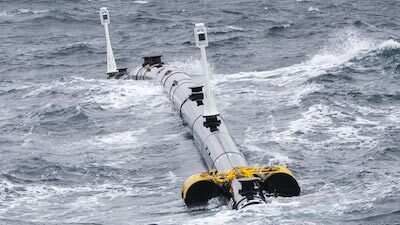 The system is designed to be propelled by wind and waves, allowing it to passively catch and concentrate plastic debris in front of it. Due to its shape, the debris will be funnelled to the center of the system. Moving slightly faster than the plastic, the system will act like a giant Pac-Man, skimming the surface of the ocean. Once successful, and if the funding is available, The Ocean Cleanup aims to scale up to a fleet of approximately 60 systems focused on the Great Pacific Garbage Patch over the next two years. The Ocean Cleanup projects that the full fleet can remove half of the plastic in the Great Pacific Garbage Patch within five years’ time. This is in line with The Ocean Cleanup’s ultimate goal: reducing the amount of plastic in the world’s oceans by at least 90% by 2040. Unfortunately, System 001 can do little about plastic which has fragmented into microscopic particles, but these make up just 8% of plastic in the gyre. And it the world keeps disposing of plastic that finds its way into the ocean unabated, the incoming debris would outweigh the fleet’s capacity to skim it within a few years. Ultimately, the ocean’s plastic problem cannot be solved without better waste management on land.